Finally last weekend I got round to making this wonderful dish. And I wish I hadn’t waited so long, because even if I say so myself, the rassa tasted damn good. To make the soup, you need to pressure cook the mutton (I chose to take mutton on the bone to get extra flavour) with ginger, garlic, salt and lots of water to create a flavourful stock. And then you need to add the stock to minced onions, grated coconut and spices along with a good quantity of the Kolhapur masala powder. To get a smooth finish, I strained the soup after cooking it and then served it with the boiled mutton and a side of rice. And yes, the colour on this soup is a fairly good indication of its heat level. But if you like spice, then you must try this dish. 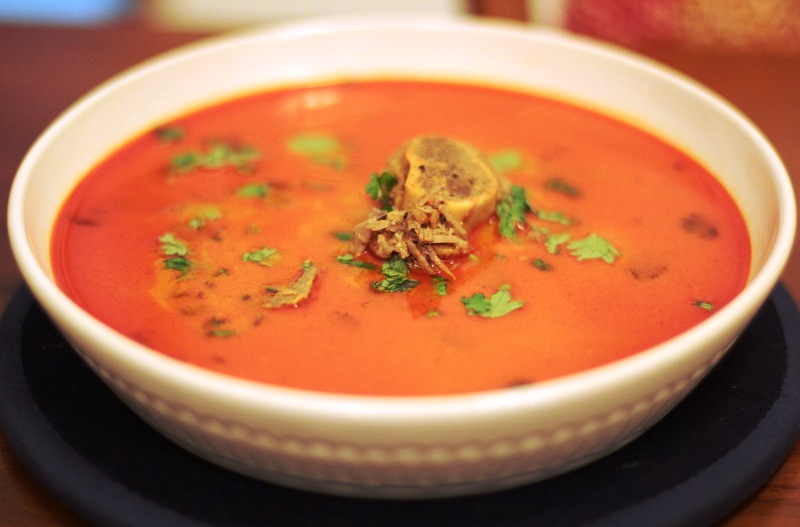 This entry was posted in Marathi cuisine and tagged kolhapuri masala, mutton, soup, Spices. Bookmark the permalink.